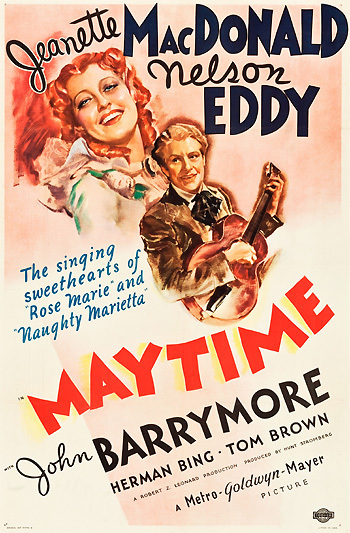 Maytime (1937) is a beautiful, enchanting classic romantic musical from the 1930s. It is the third Jeanette MacDonald and Nelson Eddy operetta and often considered the best of their eight pairings. In 1906, at a May Day celebration, a, sweet, sheltered elderly, mysterious woman, Miss Morrison (Jeanette MacDonald) meets a young man Kip Stuart (Tom Brown) who tells her that he is having disagreements with his fiancee Barbara Roberts (Lynne Carver). She yearns for a singing career and doesn't want to give it up to marry him. Later, she overhears them quarreling on the road near her home. Confiding in the lonely, melancholic Miss Morrison, the young woman asks if she understands. To help the young girl understand, she relates the story of her life - she was formerly an opera star named Marcia Morney (Jeanette MacDonald) in Louis Napoleon III's Paris of 1865. In flashback, she tells of her own great tragic love affair, sadly dreaming of her lost love. Trained by a skillful mentor and voice teacher, Nicolai Nazaroff (John Barrymore), he guides her to operatic success in Paris. She relates how he asks for her hand in marriage and in gratitude she accepts, but not for love. That night, excited and unable to sleep, she goes for a cab ride and happens to meet a poor, but young, handsome, homesick American singer Paul Allison (Nelson Eddy) in a Parisian Latin Quarter bistro. Thrilled to meet a fellow American, he invites her to a lunch of Virginia ham and eggs and they have a fun time together. Visiting her backstage following a performance, he invites her to a country May Day fair the next day and she accepts. Fun. I never knew there was such fun, such, such happiness. I've never been so happy in my life. It's been wonderful. Paul: I met you too late, yet something inside me won't let me believe it. Marcia (quieting him): Please, Paul. Let's, let's just remember this day. Paul: We will, Marcia, one day to last us all the rest of our lives. Marcia: It will, it will. Paul: I'll always love you. Marcia: And I'll always...remember you, and your song. She sings the same song with him, as they say goodbye, knowing that their precious time has ended. She feels committed to her wedding vows and marries Nazaroff. With separate blossoming careers, seven years later, Paul and Marcia co-star in an American production, singing opposite each other at the Metropolitan Opera. When they first meet and are introduced to each other at a rehearsal, he speaks first: "It's an honor, madam, to sing with you." She knowingly looks at him, responding: "Thank you, very much." Marcia: Oh, don't ever leave me again, ever. Paul: I love you darling, I love you. Marcia: And I love you too. Paul (promising): You're not going back to him. I'm taking you away tonight. The opera sequence rekindles their undying love for each other. Nothing could have stopped this happening, Nicolai. I never realized what a terrible mistake I made when I left him. I, I thought then that I had to keep my promise to you after all you'd done for me. I tried to forget him. I tried to put him out of my mind, but was never able to. And now, tonight, I realize that I love you more than anything else in life, and I can't go on living without him. Nazaroff promises to set her free, if that's what she wants, but proceeds to Paul's quarters and shoots him. That day did last me all of my life. Don't cry, Marcia. You won't be lonely. I'll be close always. The story then returns to the present. The story of the tragic romance encourages the young lover to contemplate her own love life and career - she decides to accept love over career and reconciles with Kip. In the final unforgettable scene, the aged Miss Morrison dies, and her forever-youthful spiritual image rises from her body to meet and reunite with Paul's spirit singing to her within the garden gate ("Sweetheart, Sweetheart, Sweetheart") "Will You Remember?" ("To life's last faint ember, we will remember Springtime, love time, May"). As flower blossoms shower down on them, they walk down the path, in one of motion picture history's most poignant and sentimental endings.